Last December I started measuring a few things about myself every day. Now, four months in, I’d like to take a look at how it has gone and what that data has shown me so I can improve upon the system. Over 102 days I completed the survey 80 times. Based on that I would deem the method a success. Any system that is able to remind me to do something and succeed in getting me to do it ~80% of the time is doing pretty well in my book. Pivoting my completion percent by the day of week gave me the following. 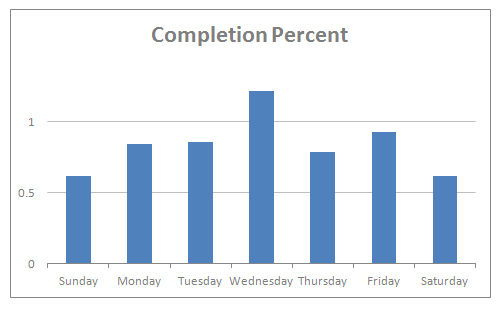 The astute reader will notice that my completion rate was >1 on Wednesdays. I thought there might be a bug or double logging errors in my system. When I looked into it I realized that a few of those were actually my Tuesday records being logged sometime after midnight. I’ve been doing these innovation sessions which often keep me up past my usual bed time on Tuesdays. Nonetheless, mid-week my success rate is much higher than on weekends. This is probably due in part to the fact that on weekends I am more likely to be out of cell range while camping. I am also often hanging out with people at 8:00PM when my reminder sounds and sometimes forget to do it when I get home. A snooze option might help with that. I’d like to evaluate each category on its success. Looking at these I don’t see much of a trend. After some iteration I landed on measuring my health in six areas on a scale of 1-10. On their own the items aren’t very helpful because they aren’t associated with any sort of action items. Data without action isn’t very valuable. In order to make these items valuable I will need to associate them with something else. For example I could associate my vocational health data with records of who I had meetings with that day to help me see who I enjoy working with and who I might avoid when possible. If I can find a few fact items to associate with each of the six health items I might be able to make use of these but as they are, there isn’t much to see. These were free text questions about how I succeeded and failed that day as well as what I was excited or worried about. Unfortunately free text processing is not my strong suit and so I am at a loss about what to do with these. I usually only wrote down a few words and so there isn’t much detail. Looking for the most common words returns a lot of generic words; got, was, had, etc. In order to make this section more useful in the future it might be helpful for me to create some categories to choose from or to get more text recorded so I can better use it in the future. Overall I think the benefits from these questions actually fits better in the next section. These were questions I asked myself because answering them would require me to reflect on my day. The questions were all along the lines of “how did you demonstrate X today?” The responses were free text and so I didn’t leave a response if I could’t think of anything for that day that answered the question. It turned out I recorded something only ~35% of the time. Despite that, I think having these daily questions was actually a positive thing. Even on the 65% of days I did not have answers, I asked myself the question. Skipping putting in an answer came with a desire to try harder tomorrow. The system I set up to gather data is actually fairly effective, the questions I ask need improvement though. I would like to see more actionable items coming out of these daily surveys and so I will need to hit the drawing board again. When I sit down again I’d like to dig into some aspects of my life that I have the power to change and that data can help influence my decisions on.